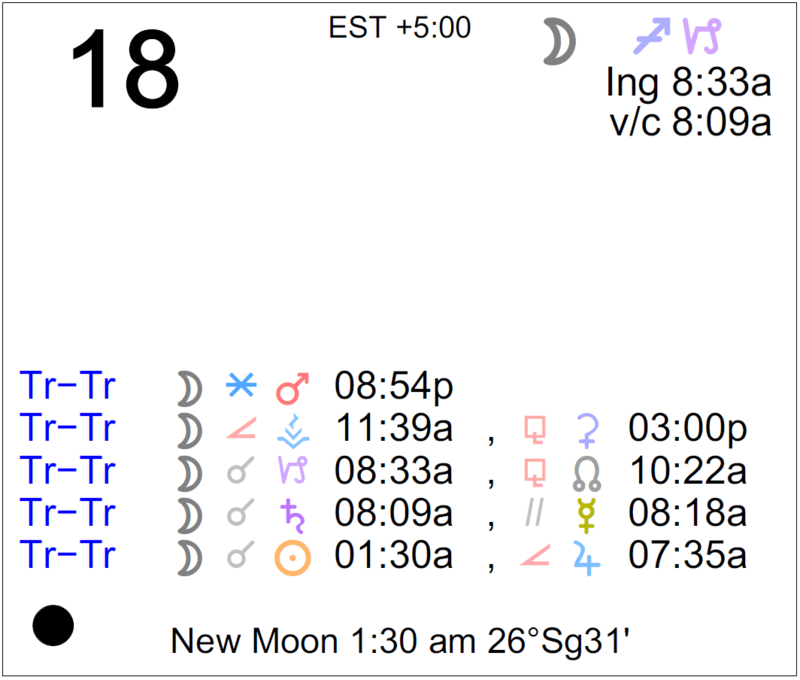 The Moon is in Sagittarius until 8:33 AM, after which the Moon is in Capricorn. The Moon is briefly void from 8:09 AM to 8:33 AM. The Moon is waning and in its Waning Crescent phase until 1:30 AM, after which the Moon is waxing and in its New phase. The New Moon occurs today in the sign of Sagittarius at 1:30 AM. Mercury is retrograde in the sign of Sagittarius (Mercury is retrograde from December 3-22). 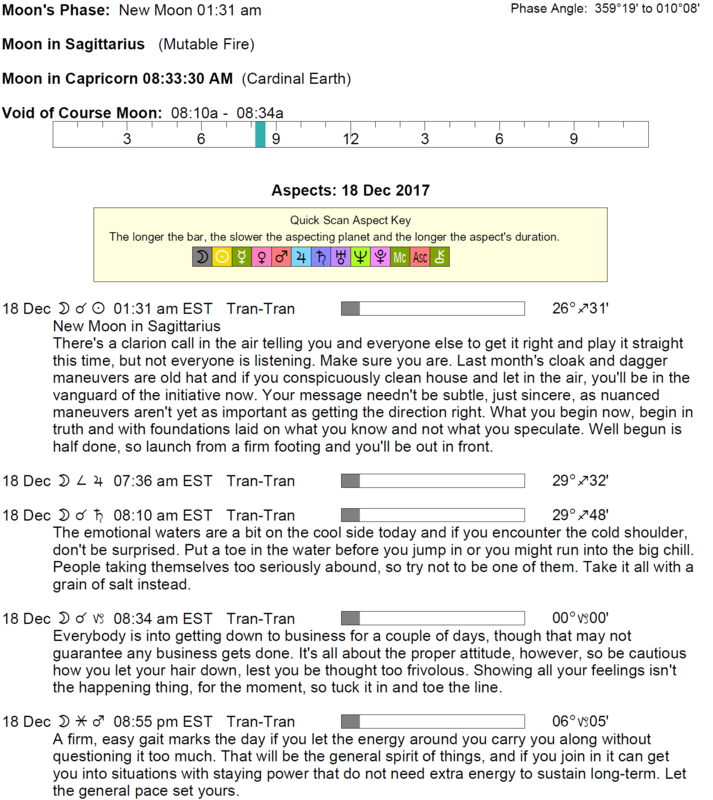 Note: Until I complete the yearly 2018 horoscope previews, overviews, yearly love, and full yearly horoscopes on my site, Cafe Astrology, I will use an alternate author for some of the days’ daily horoscopes (starting with December 16th), found on Cafe Astrology here. When I’m back to writing the dailies (very soon), they will appear once again on this site in this horoscope section. The new year is quickly approaching, and this brief hiatus will help me complete 2018 horoscopes in a timely manner! If Your Birthday is December 18th, If Today is Your Birthday full horoscope here. It’s a New Moon and we have a chance to wipe the slate clean and start anew. This is an impulsive time. Sabian Symbol: Three stained-glass windows, one damaged by bombardment. A New Moon. Intensity of focus, a new beginning, fresh energy, intiative, impulse. Sabian Symbol: A chinese laundry. You are intensely committed to your work. Dedication and the ability to focus are keys to your work. Sexual morals may feature strongly as you seek to either break existing sexual mores or repress sexual urges behind a strict code of ethics. Sabian Symbol: A woman the father of her own child. You have a keen intellect with the ability to come up with exciting, new ideas. You are also happy to risk putting your new ideas into action. Cnj 22°Sg41 RAS ALHAGUE The desire to heal a wound. Sun 02° Taurus 37' 05"
Moon 18° Sagittarius 29' 55"
Mercury 07° Aries 39' 31"
Venus 02° Aries 53' 01"
Mars 15° Gemini 00' 03"
Uranus 02° Taurus 31' 00"
Chiron 03° Aries 38' 08"